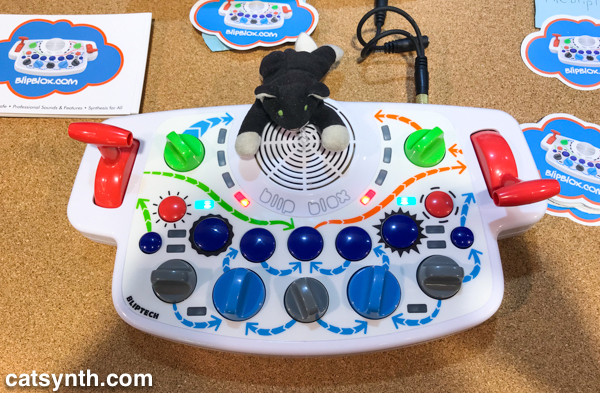 Among the more unique instruments that we saw at NAMM this year was the Blipblox, a fully functional synthesizer in a plastic shell reminiscent of children’s toys. Don’t be deceived by its appearance. The Blipblox is a full-featured monophonic synthesizer with selectable signal topologies and oscillators; a low-pass filter; a sequencer; and even a drum machine. There is also a modulation matrix to complete the feature set. In some ways, it seems similar to overall style and concept of the Moog Mother-32, though it is of course a very different instrument. You can hear a bit of our attempt to play the Blipblox in this video. It certainly seems like an interesting way to introduce kids to synthesizers and both the science and art of sound. But it also seems quite usable for live performance – if it’s rugged enough for kids, it’s probably rugged enough for the stage. We look at it an immediately think of the repurposing of musical toys for experimental electronic performance via circuit bending. Whether a Blipblox is bendable or not is beyond the scope of this initial look, but it would certainly fit in with a setup that includes such modified instruments. At NAMM, one tries out a lot of instruments and walks away wanting to have a good number of them. The novelty fades quickly, but some you find that you continue to really want. The Magneto module from Strymon is in the latter category. The Magneto is a four-head tape delay simulator. Its controls are very intuitive and playable, with enough flexibility to be used to generate spring-reverb-like sounds as well as function as a looping device via a mode switch. You can see our first attempts with the Magneto in this video. Strymon put a lot of attention to detail both in terms of sound design and usability into this device. 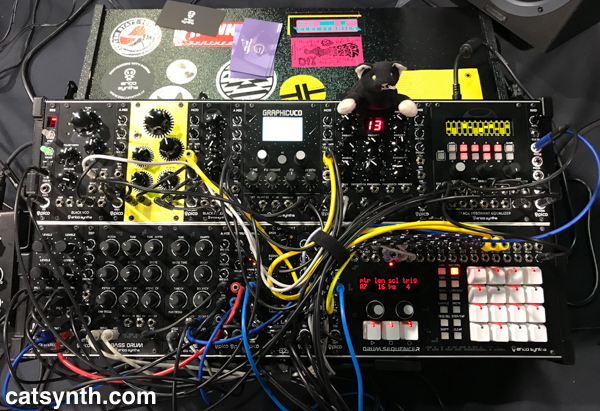 And as one would expect from a Eurorack module, just about every function can receive external CV input, making it more of a musical instrument in its own right than it would be in a studio rack or even a guitar pedalboard. We were able to observe the delay and looping functions in great detail, but it was more challenging to discern the tape-effect functions, such as “wow-flutter” and “crinkle”. Part of that is just the chaotic environment of NAMM (even in the more calm depth of Hall E). Hopefully, we will get a chance to try those out in more detail in the near future. 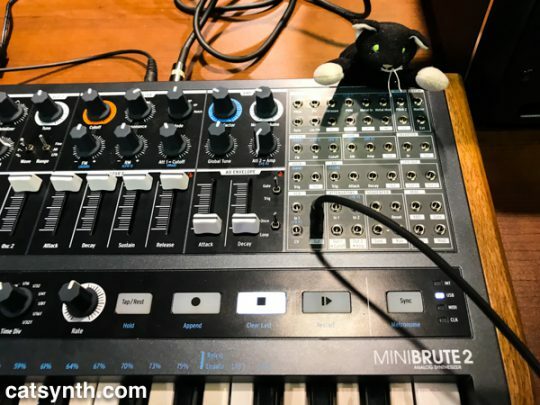 We continue to work our way through our experiences from NAMM 2018 with the Arturia MiniBrute 2. The original MiniBrute made quite a splash a few years ago with its all-analog signal path, usability, and low price. It also had a sound that was distinct from other low-cost analog synths, in part because of the “Brute Factor” knob. That knob is back in the MiniBrute 2 along with a Steiner-Parker filter that together with the Brute oscillator gives the instrument its sound. But there is now a second oscillator, and, perhaps more significantly, a modulation matrix and patch bay. 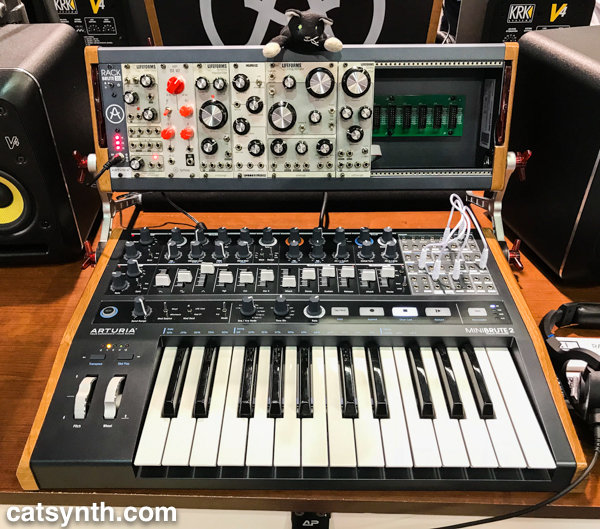 The built-in synthesizer topology includes a lot more modulation than the original, and the patch bay allows for reconfiguration and expansion with the RackBrute Eurorack cases that integrate 3U or 6U or modules with the MiniBrute in a single case. This does seem to be a trend we are seeing with built-in patch bays to full analog mono synths (the Moog Mother-32 being the prime example). One can also interpret the MiniBrute 2 as incorporating ideas from the flagship MatrixBrute writ small. The ecosystem also includes an alternate form-factor, the 2S, which has drum pads reminiscent of the BeatStep Pro instead of the keyboard. 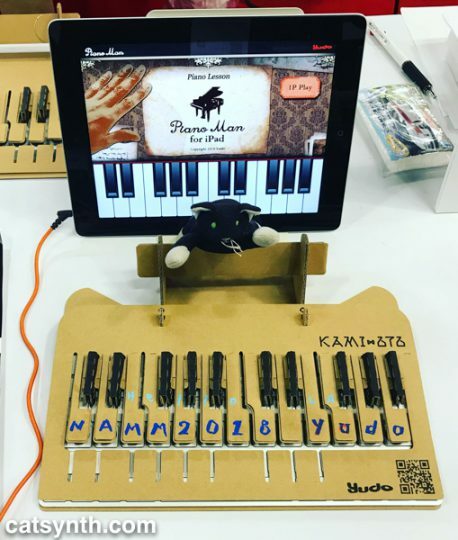 We were only able to scratch the surface at NAMM, and also had a bit of difficulty with our video. So we are hoping to provide a more in-depth look at this instrument both here and on CatSynth TV in the not too distant future. 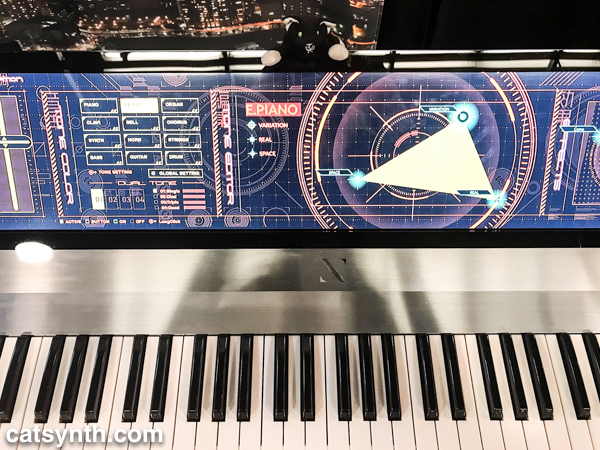 We continue to work our way slowly through the embarrassment of riches from NAMM 2018 with a look at new modules from Erica Synths. The biggest of the new modules, both physically and in terms of garnered attention, was the Drum Sequencer module. 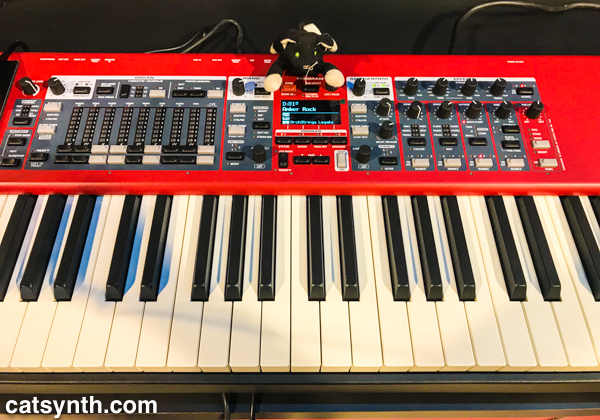 It has an attractive retro look and feel with a raised keypad and red LED display, reminiscent of instruments and studio gear from the 1980s. 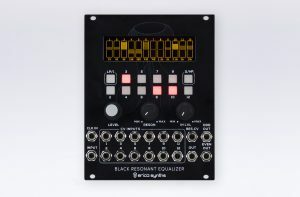 It also features 12 independent trigger outputs and 12 separate accent outputs – of course in the context of a modular synth one need not use the accent outputs for “accents”. 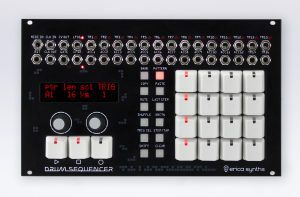 The sequencer itself is full-featured with separate meter and length per track as well as independent shuffle and probability per step. The probabilistic step function is intriguing, and one I did not have a proper opportunity to explore at NAMM, so hopefully I will get a chance to do so in the not too distant future. 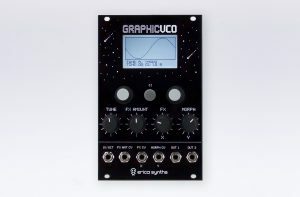 The Graphic VCO returns to a more contemporary design found in many digital Eurorack modules. This module allows the user to draw his or her own waveforms Etch-a-sketch style to use in two simultaneous wavetable oscillators. In addition to mixing, they can be arranged in different topologies for FM, ring modulation, waveshaping and more. The waveform selections and configurations can be sequenced for continuously morphing sounds. It would be interesting to use with the Drum Sequencer. The final module we looked at was the Resonant Equalizer. It is basically a 12-band bandpass filter with each band independently controllable via CV. One can also control all the bands with a single CV input for sequencer-based changes. Again, this feels like a module that would work well in tandem with the Drum Sequencer. It also has an attractive visual look for live performance use. We congratulate Tuna and rest of the team from Erica Synths on their offerings for this year’s show, and hope to someday visit them in Latvia. 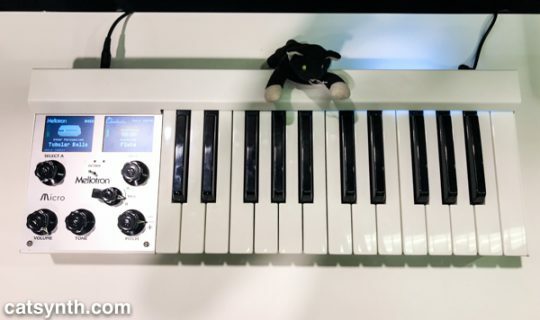 We at CatSynth have a soft spot for the Mellotron, the electro-mechanical precursor to digital samplers made famous in recordings by the Beatles – remember the opening flute riff from “Strawberry Fields” – as well as King Crimson, and many others. We have used sounds from the Mellotron in our own music and in collaborations with Vacuum Tree Head. 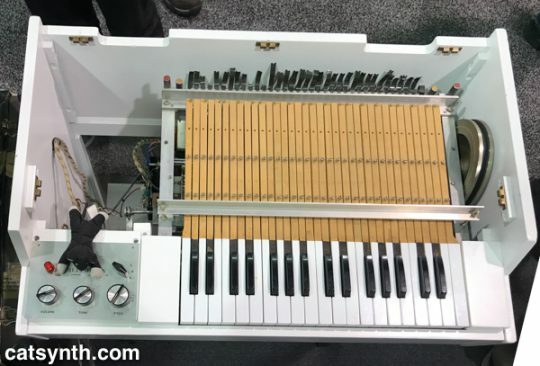 So was a treat to visit the Mellotron booth at NAMM and see versions both old and new. 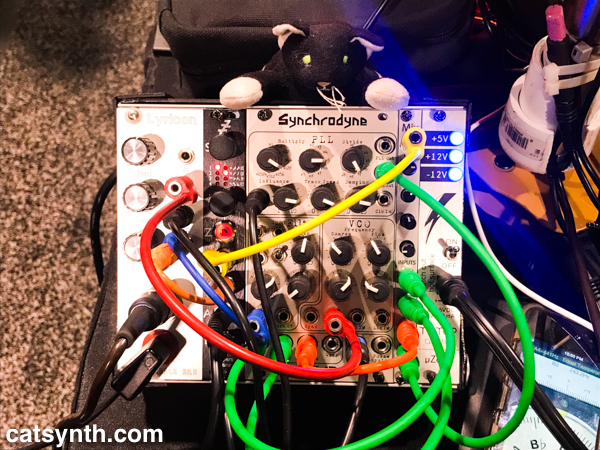 We featured them in a recent CatSynth TV. It is particularly interesting to see the inside of the vintage Mk2 in action. The Mellotrons (and their predecessor, the Chamberlain) generate sound by passing a tape head over a strip of magnetic tape for a particular pressed key. The sound is determined by the tape, the speed of the head, and other idiosyncratic factors of the instrument. Although originally intended as home/parlor instruments, they found a place in the rock albums of the 1960s and 1970s before falling out of favor for digital samplers. They were heavy, temperamental, and difficult to maintain. But Mellotrons have had a bit of a revival in the early 21st century with a reissue of the electromechanical version as the Mellotron M4000 and its all-digital counterpart, the M4000D. Most recently, the new Mellotron line has been extended with the M4000D Micro. The Micro has most of the features of the larger digital Mellotrons, including a large library of samples from original Mellotron and Chamberlain tapes. Two different “tapes” can be loaded at once and blended with a mixer control. It has speed and tone controls, and a post-sample audio engine that adds some of the non-linear characteristics of the originals. The Micro is an attractive size (and at $990 is the least expensive) for those who want a playable portable version of the celebrated instrument. There are less expensive ways to get some of the sounds – we have the Mellotron XL app for iOS that has been sanctioned by the company, but it doesn’t have MIDI support they way the standalone instruments do. 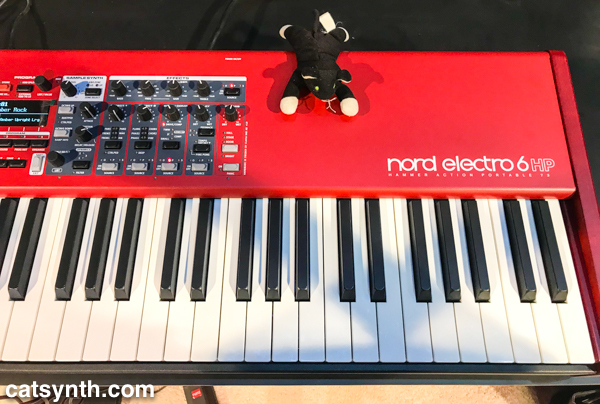 Good patches can be found in the Nord Sample Library (see our recent Nord article) as well as older instruments such as the trusty E-MU Vintage Pro that we use at CatSynth HQ. But the M4000D series is the closest one can find digitally to the original – if that is important to one’s music, these instruments are worth checking out. NAMM is full of serendipitous moments. One of those occurred as we passed the WMD booth and saw a live performance unfolding with flute and woodwind virtuoso Pedro Eustache performing on a vintage wind instrument controlling a WMD Synchrodyne module. We featured it on CatSynth TV. Eustache informed us that his wind instrument was an unusual one from the 1970s, and that he was using it as a CV controller for the Synchrodyne. He found the combination to be quite expressive and complete, and we can certainly hear that in his performance. Containing several pieces to a traditional synthesizer voice, the Synchrodyne is a powerful addition to any subtractive oriented system. However, it is designed primarily as an experimental sound source/filter, intended to push the limits of modular synthesis…WMD style. We would be remiss if we didn’t visit the Korg booth at NAMM, especially as Waldorf was there as well. We took some quick peeks at some of the new offerings, which you can see in this video. 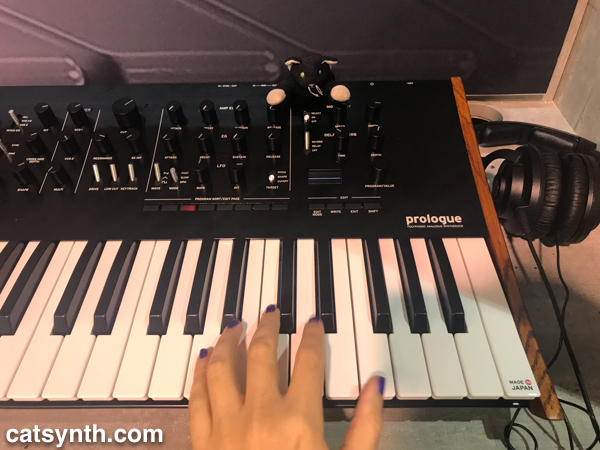 The Korg Prologue synthesizer was among the most hyped instruments leading up to NAMM, so we of course had to check it out. It is quite pretty, with a sleek black front panel and wooden side panels. 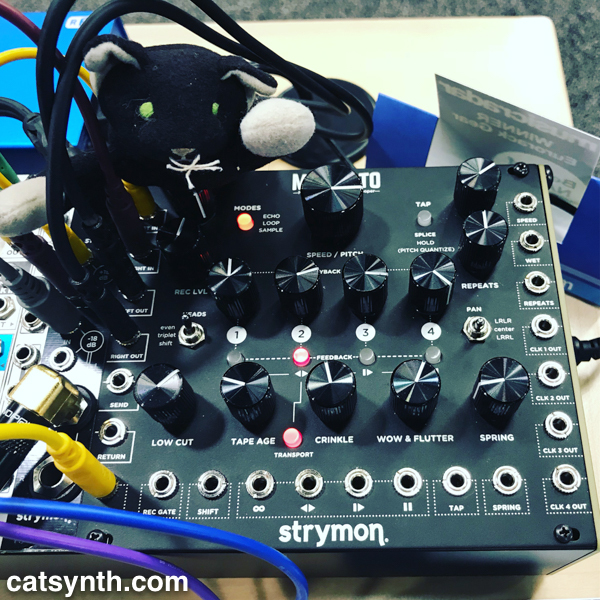 The analog synth was not that exciting to us, as we at CatSynth are rather spoiled by the offerings of Dave Smith Instruments such as the Rev2 or Prophet 6. And it doesn’t fill the niche of the Minilogue as an affordable polyphonic analog synthesizer. What intrigues us is the open architecture for the digital oscillators that will allow advanced users to add their own programs. At NAMM, it is difficult to impossible to explore this, but we look forward to learning more about in the future. By contrast, the Waldorf STVC string synthesizer and vocoder was fun to play and sounded great on our first test. The vocoder played more smoothly with my voice than the Roland VP-03 that I frequently use (including in the opening for CatSynth TV). But it does require dialing in the exact right patch for one’s voice. When we returned to the booth to record our video segment, it took a while to find something that worked, and it wasn’t quite as good as that first time. But we know this is part of the deal with vocoders, and they require practice to play well. 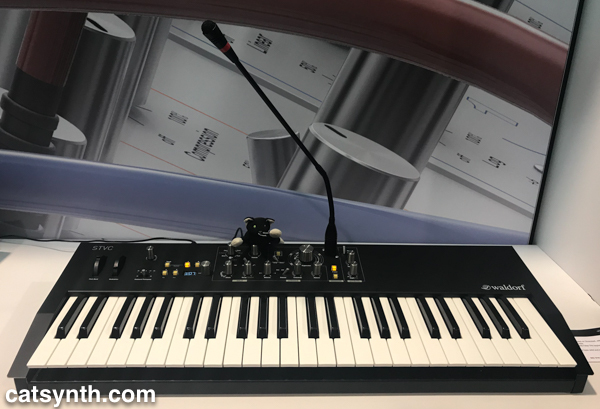 We visited our friends at Rossum Electro-Music at NAMM and were treated to an in-depth demonstration of their Assimil8or module by Marco Alpert. We are grateful to Marco for his demonstration, not just because it made our video awesome, but because it helped better understand what is a complex module. The Assimil8or is a sample engine with many of the features one found in classic E-MU samplers, and more (Dave Rossum being the mastermind behind E-MU’s popular instruments). One particularly intriguing advance was the timed switching among samples, which allows one to move between different tracks seamlessly while remaining in time (the Cars example in the video demonstrates this quite well). There is also “virtual tape-scrubbing” of audio. Of course, everything is CV controllable. 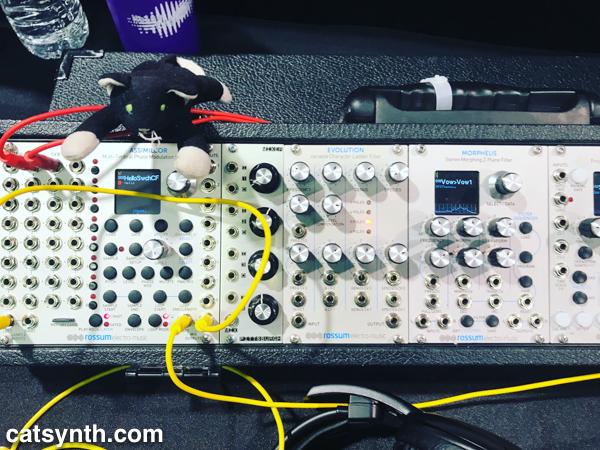 Combining the Assimil8or with the Morpheus module (which we at CatSynth own and enjoy) and the Control Forge, one can assemble something akin to an E-MU sampler on steroids, with vastly more complex and rich control options, including at audio rate! Even the Morpheus on its own is rather overwhelming, but having seen the modules in action by the folks who made gives us ideas on how to use it better. We look forward to more experiments with these modules from Rossum Electro-Music! More info can be found at http://www.rossum-electro.com.